my dinner at the leader hotel in taroko gorge was presented on oddly-shaped plates neatly arranged on a varnished wooden tray. a chunk of meat cut in two places was the centerpiece of this meal, and i had to ask CY what it was called. it was obviously a fusion of east and west, i thought, judging from what i had just heard, and i noted it down so that i could blog about it at some future time. but i wasn't sure if i had written it correctly, so i asked CY: "do you spell it w-a-y-b-o meets the eiffel tower?" CY's brow clashed disapprovingly and he gave me this perplexed look. "waybo! waybo!" 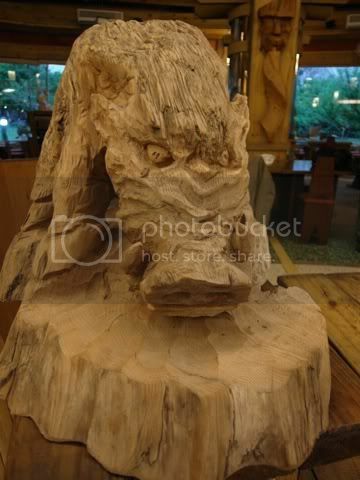 he repeated as if i had not exhibited any form of intelligence in the past and pointed to the wooden sculpture of an animal nearby. it took me a while to realize that the hoofed quadruped with spikes on its back and what seemed like fangs protruding upward from its snout was a wild boar. i had complained about the less-than-satisfactory meals i ate while climbing xueshan, and by my estimate, i may have lost at least five pounds from the combined exercise and crash diet, but i took all that back, and possibly more, on my first meal back in the plains of taiwan. 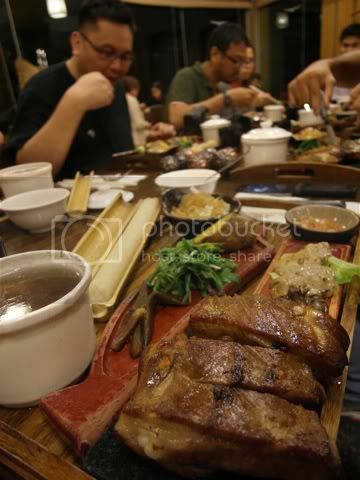 dinner at yilan city was courtesy of the climb fee, and our guides spared no taiwan dollar in making sure we were happy. in fact we were, i immediately forgave them for scrimping on our food while we were at the huts. following the chinese custom that leftovers are always a good sign, dishes kept coming that evening and we devoured everything that was placed on the table until there was no room in our stomachs to put them in. exhausted from the hike and still burping from the feast, we went back to our hotel to fix our things. after about an hour, we were on the wet streets of yilan again prowling for some late-night fix. we managed to pass by a small hole in the wall where the obviously drunk owner called us in for beer. 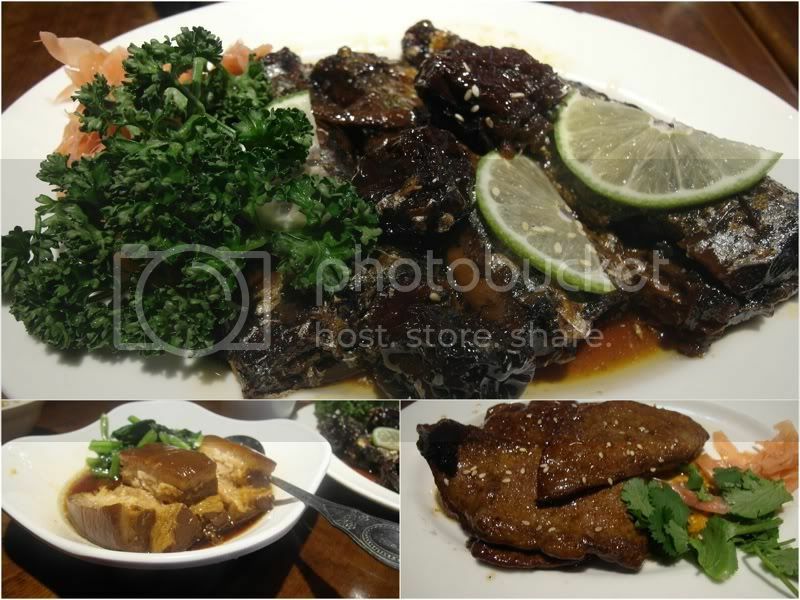 they served really good grilled beef, and to show his appreciation, the garrulous owner showered us with peanuts. since we had decided to have just one round of beer, we stood up just as the rain started to fall, and we got stuck in front of a store that sold chicken and duck parts. it wasn't the most enticing display but we left with a bag that we ate at a roadside restaurant which had a grand staff of two: the auntie took orders and served, while the uncle manned a kitchen of 3 burners. 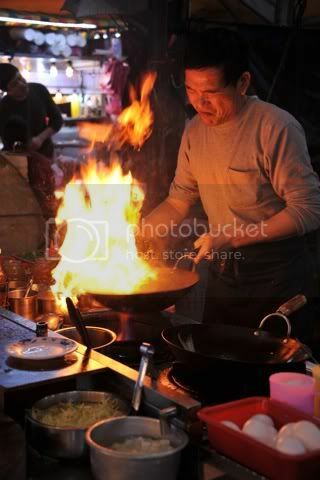 at one point, he was tending to three dishes at the same time, sauteing vegetables, frying fish, and setting another pan aflame. and the food they served was really good too. 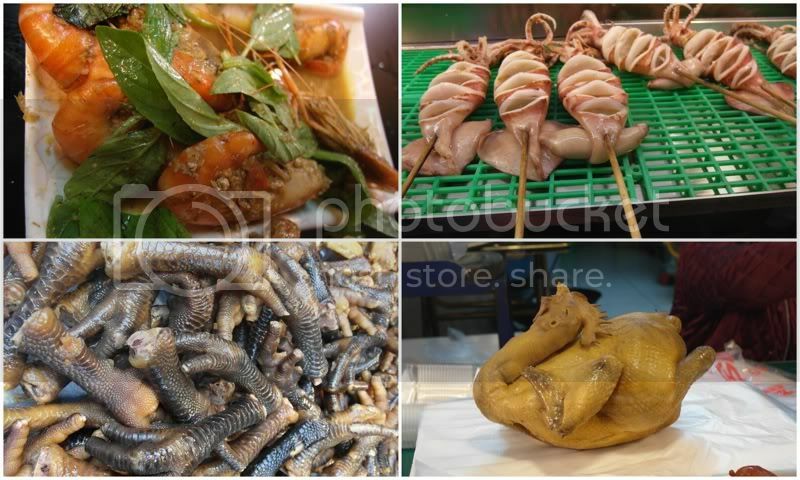 on my first visit to taiwan some years back, i remember being very happy with my food finds. i spoke (and still don't) no word of mandarin, and could not tell the difference between traditional and simplified chinese characters, so my choices were limited to those where there was an english menu, or where the menu was a picturebook, or where the waiters spoke some english. in this return, however, i was happy to just follow CY around. despite his sometimes expensive taste, CY loves food, and knows exactly where to find them. plus he also speaks the language of more than a billion people, so i made him decide where i would be eating for most of my taiwan tour. on our last day in taipei, i told CY that i would surrender my day to him. kuya mar and i made him decide everything we would be eating, which also meant he would dictate where we would go. i trusted his taste, and just hoped that by the end of the day, i wouldn't be bankrupt. since i was eager to have din tai fung again, we went off to the original branch in xinyi. it wasn't 11AM yet, but there was already a queue outside. i was expecting us to wait at least 10 minutes, so i raised my palms over a metal pillar that was providing heat to the eager eaters. finally, our number was called, and we sat at a small table. the diners at the tables nearby were already gorging on different kinds of dumplings, but CY only ordered two dishes for us: the traditional xiao long bao and a shrimp dumpling. he gave instructions on how it would be eaten, and kuya mar quickly learned, although he was so fond of the ginger with black vinegar and soy sauce that he sipped it after each dumpling, pinoy style. without telling us what would happen next, we moved to another restaurant where we each had a bowl of noodles and a plate of shrimp tempura. there was a woman on a stool near the door, pouring soup into containers, and dipping metal nets filled with noodles in a vat of boiling broth. 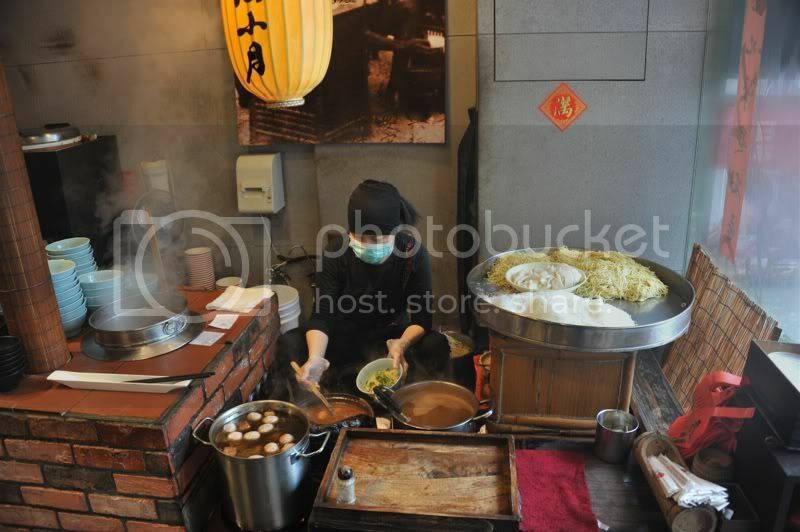 it was probably a recreation of the traditional noodle house because behind the woman was an old, faded, black-and-white photo of almost the same scene. i thought it would be our last restaurant for the day, and that we would finally go and look for the camera i hoped to buy but CY had other plans. we walked to another restaurant and ordered 4 dishes. i wanted to ask at that point if he was serious, or if we had planned to go to a fourth, fifth, or sixth restaurant just for lunch. as a matter of fact, we did go to six places that day, since we spent most of the day eating. the third restaurant served the best sardines, braised pork, and liver i've had in years, i would go back there if i could speak a word of mandarin. they do have pictures, so if ever i'm in the xinyi area, i know where to go. we gobbled every morsel of rice that was served, and i was about to beg CY to stop the madness, but we still ended up having shaved ice with fruits. later on, after a visit to camera street, we had tea and coffee near ximending, then afterwards dinner at another restaurant near the sun yat sen memorial. it wasn't the fanciest place i've visited in taipei, but it was so crowded we had to share our table with complete strangers. a funny-looking man whose unappealing combover stole my appetite took our order. CY actually apologized before the food arrived that he had ordered only two dishes. but the food was so good that i forgave our order taker for his bad hair, and i told CY he had nothing to be sorry for -- i was just so happy to have decided to let him take me wherever his nose and his tastebuds took him. when we arrived in taipei, CY actually worried about how people might react to his choice of eating places. he was concerned that the others might find his suggestions too expensive. he didn't want to let us non-chinese speaking filipinos lose in the streets of taipei devouring strange meals. and there were plenty of them, beginning with the night market just outside JV's hostel where we stayed. there were rows of restaurants there, and i could honestly have eaten in any of them, but my malaysian friend's discerning palate was not easily pleased. 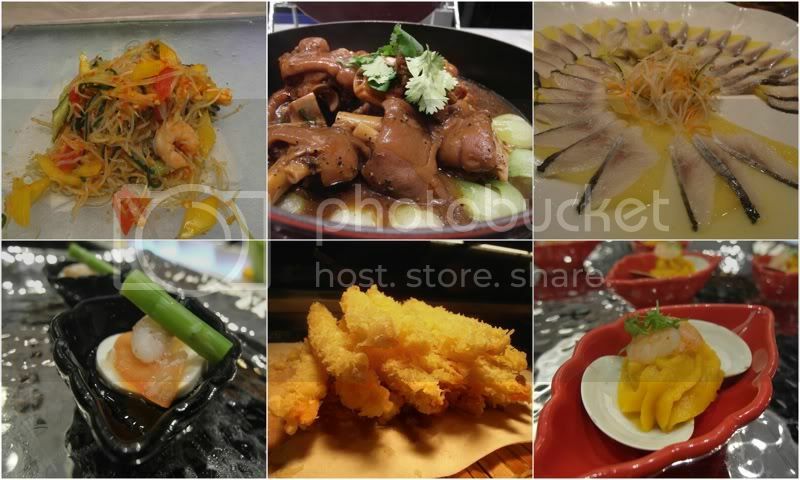 on the night i joined him for a buffet at a mall near taipei 101 -- and you'll have to forgive me if i can't provide any further details since i failed to ask what the romanized names of most of these restaurants were -- he worried about where the others would eat. i told him not to be bothered, since they are seasoned travelers who seldom need the services of a guide, nor that of a translator, even in the most exotic of places. so we enjoyed our NTD850 buffet which could easily rival some of the best manila has to offer, particularly because they also served unlimited beer and unlimited häagen-dazs, although i honestly don't think you can have too many of both, even of either. i made it a point to be able to taste everything on the japanese food corner, but also stuffed my plate (and my mouth) with little servings of everything. what really impressed me about the restaurant was that they didn't put big pots over small fires. 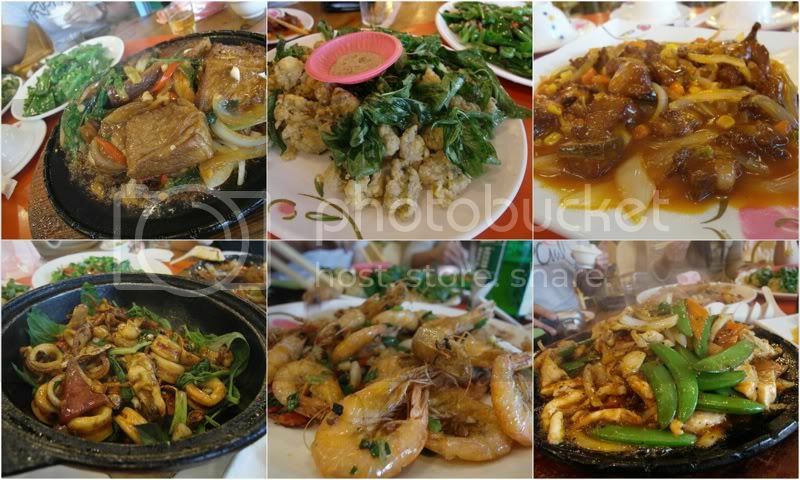 instead, there were limited portions which got refilled by a fresh batch every now and then. most buffets really distract the poor quality of the taste with the variety of the selection, but this was not the case with this restaurant. we had to shake off all those pounds by walking back to our hostel, almost 20 minutes away on foot. i used to think that singapore was the asian foodie's paradise. that is still probably true, if you are hindered by knowing only the english language. if you can even speak a little mandarin, try to explore the gastronomic wonders of taiwan, and you'll discover a world of flavors, aromas, and textures that will satisfy your salivating taste buds.